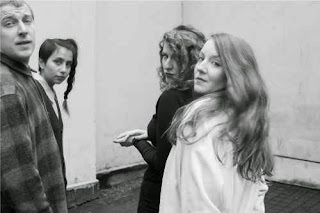 Initially making their name as Lulu And The Landshapes - most notably popularising that folksy Cups song which would subsequently appear in surprising smash hit film 'Pitch Perfect' - the band dropped 3/4 of their name and moved in a more forceful musical direction. The latest fruits of that approach will be released tomorrow, with the arrival of second album 'Heyoon' on Bella Union. Check out pulsating album track 'Ader' and the Cups cover below. 'Ader' gallops along in a carefree fashion, somewhat reminiscent to Veronica Falls' best material. There's hints of post-punk and psychedelia in the instrumentation, and lyrically the song reflects artist Bas Jan Ader who was lost at sea in 1975, presumed dead. His spirit lives on in this excellent track. Find more info at landshapesmusic.com.